Few weeks ago Husbando bought a new motorcycle. New as in “next one in the line of the motorcycles he drove for the last 12 years”, not “freshly forged in the fiery chasm of Honda’s factory in Japan”. 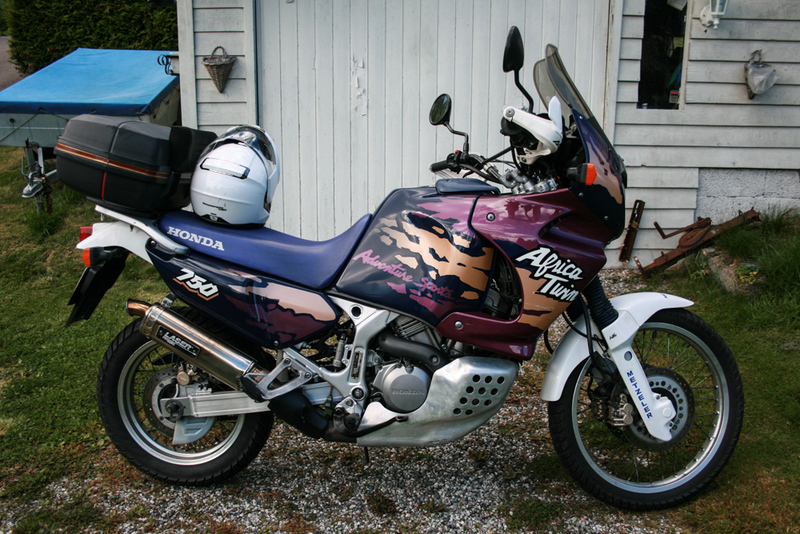 He is a huge fan of Africa Twin motorcycles, so after he found this beast of a machine on finn.no, he went to a small village near Hamar (cca 160 km from Oslo) and came back home riding a motorcycle which is pretty much popular among many moto-travelers. His previous rules-to-live/drive-by were: a motorcycle must have a kickstart, must be air cooled and has to have no more than one cylinder. Africa Twin does not have a kickstart (you really cannot know how huge this change is ROFL), cooling system is water-based and the machine has two cylinders (twin, get it?). All in all, this is a huge and almost tectonic change in my Husbando’s way of thinking (and motorcycle riding). I, for one, welcome our japanese overlord motorcycle because I see that we are gonna travel more through this gorgeous country.